Have you heard about the newest protest? It’s truckers threatening to shut down D.C. in October. 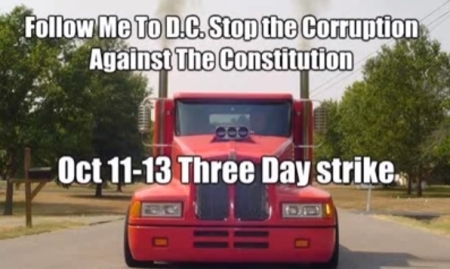 …My fellow patriot this effort is to support the truckers in a major shut down of America ion [sic] a 3 day strike October 11th thru 13th. Obamacare will be in effect and most people will be ready to take action. No commerce on those days stock up on items that you will need. No banking no shopping no money transactions. On the one hand, this is an innovative idea, but you can’t put Lois Lerner in jail without a trial, I’m not sure of the point of calling for “all Muslims in our government that do not uphold the Constitution” to be removed as opposed to anyone who doesn’t and treason is a pretty heavy lift. On top of all that, I can’t condone ANY protest that sets out to deliberately tie up traffic — even in D.C. Aggravating the average guy who just wants to get home from work doesn’t do anything to win people over to your side.